I recently heard someone say, “People can walk through three boundaries just to say hello to their horse in the morning and not even know it.” Having rehabbed senior horses for over 10 years in varying degrees of emotional shut-down, I knew exactly what she was talking about. For me, the eyes of a horse have become one of the biggest clues about their personal state of affairs. If their eyes are fixed, that is a “no”. 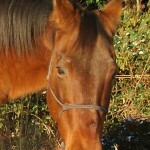 If a horse looks at you with one eye and has its head held high in avoidance, it is experiencing fear. 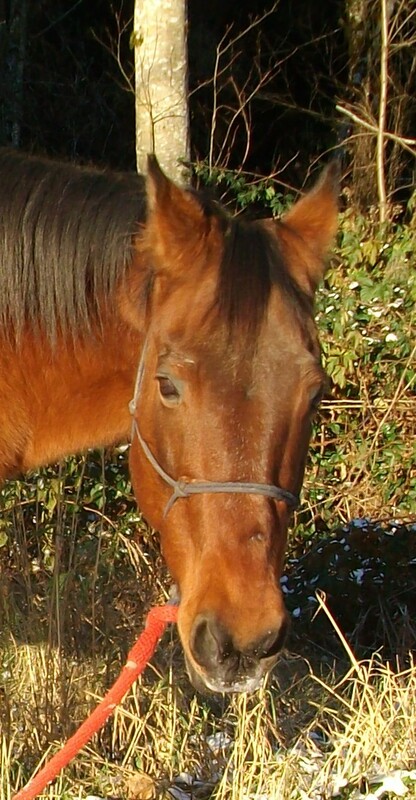 (Horses process fear on one side of their brain, so they look at the fearful object/person with the other eye). If the eyes are soft and blinking, that is a “yes”. If horses look at you with both eyes, they are giving you their complete attention. The next time I was out with the horses, I tried my experiment. I was ready to leave and was going to make the rounds to say goodbye. The pasture mate of my horse was itching for attention. She had soft, blinking eyes when I approached her. She tipped her nose toward me, breathed on me and looked at me with both of her eyes. All of those were “yes” cues to me. I gave her a scratch in her favorite places. I then went to say goodbye to my horse. He was relaxing, facing out of the shelter when I approached. I noticed his fixed eye. I slowed my pace, but his eye did not change, so I stopped. Rather than over-ride his “no” about me approaching, I stopped and copied his body language. He was facing out, so I faced out. He was relaxing, so I closed my eyes and relaxed. Without even trying, I started to yawn. It felt great to just do nothing for a moment and breathe. (Yawning is a wonderful way to release stress). 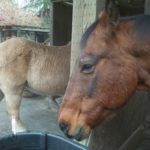 My horse started licking and chewing (a relaxation response). I kept yawning (my own relaxation response). This went on for quite some time. No agenda on my part other than to experience what my horse was already doing and see what it was like. Before long, the other horse joined us, facing out of the shelter, relaxing. I experimented with where was the sweet spot for the most comfortable way for me to stand and breathe. It was so relaxing that at one point, I did not want my horse to approach me lest it interrupt this profound sense of peace and well-being. At the end of what must have been at least 30 minutes, I felt great. 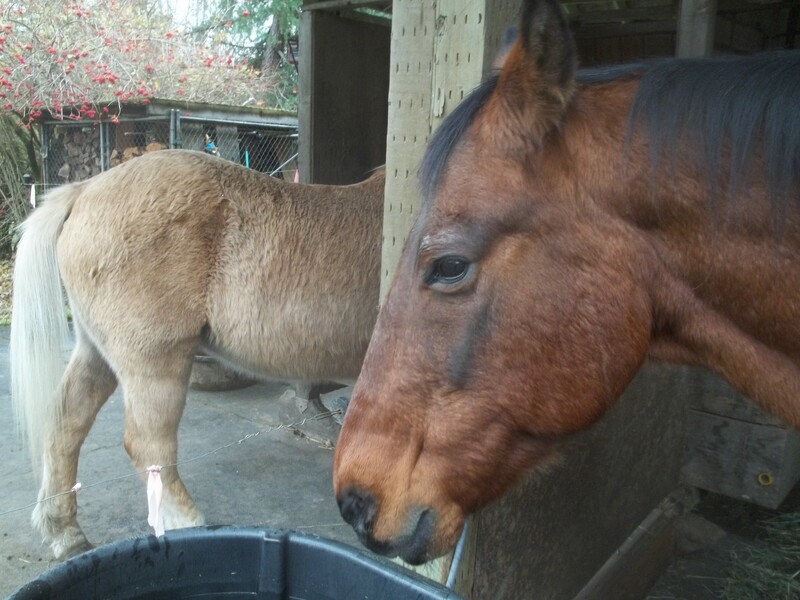 It all began with me honoring my horse’s “no” and becoming curious about what he was doing. Yes, hugs, pets and kisses are fun, but breathing and relaxing in each other’s presence, that was peaceful and invigorating. I challenge you the next time you say hello or goodbye to your pet, spend time just being in their presence, breathing and relaxing. I’d love to know what you discover.